This Saturday, January 3 at UFC 182, in a long-awaited clash of superstars, undefeated Daniel Cormier challenges light heavyweight champ and pound-for-pound king Jon Jones. 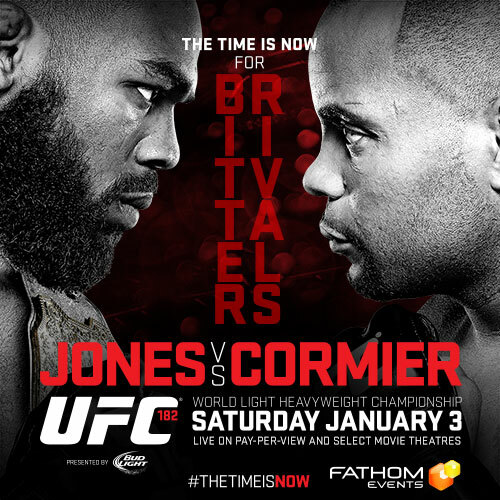 Order UFC 182: Jones vs Cormier – live on Pay-Per-View this Saturday at 10pm/9c, or watch it live on the big screen at a theater near you! Go to fathomevents.com for participating theaters! Register below to WIN UFC 165: Jones vs. Gustafsson and a pair of passes to the Viewing Party in Dallas!